Waterproofing an ICF home is substantially different from standard concrete construction and is commonly overlooked or installed incorrectly. The BuildBlock Comprehensive Guide to Waterproofing is a 15-page educational manual that is free to download and is intended to be used in conjunction with other BuildBlock Technical Manuals. The strategies, advice, and information apply to any ICF construction below grade, large or small. While it is important to place a barrier between the elements and the interior of the home, the nature of that barrier is much more important when working with ICFs. In this guide, you will learn about the nature of and why the type of waterproofing materials are important. Discover how to easily install different types of waterproofing and ensure your home is safe, comfortable, and dry. BuildBlock recommends combining methods of waterproofing for best results. Either combine a water-based primer and a peel and stick membrane or the peel and stick membrane with the DMX AG (Air Gap) membrane. 00PWTAC PolyWall Shur-Tac Liquid Adhesive 5 gallon pail Covers up to 500 sqft. 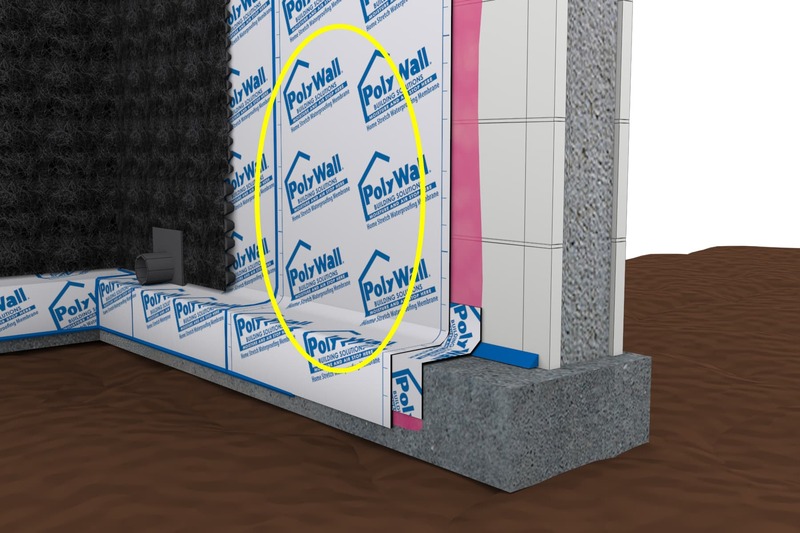 Poly Wall® Home Stretch™ Peel ‘N Stick Waterproofing Membrane is specifically designed and engineered for use with Insulated Concrete Forms (ICF) technology. It is also an excellent choice for use on poured concrete foundation walls, Concrete Masonry Unit (CMU) walls and related applications where waterproofing is critical or hydrostatic pressure is present. Home Stretch™ ICF is a self-adhering sheet waterproofing membrane 40 mils thick which consists of a strong pliable high-density polyethylene (HDPE) facing bonded to a rubberized asphalt waterproofing compound that has been proven over many years of use to a be supremely effective waterproofing. Home Stretch™ ICF is available in easy to handle and install 36” wide by 66.7’ long rolls (200 sf / roll) with a disposable treated release liner. When used with Shur-Tac™, Poly Wall® Home Stretch™ Detail Tape, Poly Wall® Blue Barrier™ Joint Filler 2200 and Poly Wall® Arroyo™ Drain Boards and accessories creates a complete waterproofing system for your ICF. Poly Wall® Shur-Tac™ Liquid Adhesive Primer is a polymer emulsion based adhesive which is specifically formulated to provide excellent adhesion with all the Poly Wall® waterproofing and flashing membranes under many kinds of surface conditions. It is designed for use on dry surfaces to condition them so that the substrate is suitable for the application of self-adhering membranes. Shur-Tac™ is an integral part of Poly Wall® Self-Adhering Membrane Systems. This liquid adhesive can be used on dry surfaces to condition them to be suitable for the application of Poly Wall® Self-Adhering Membranes and Flashings. Used to prime all structural concrete, ICF, masonry, or wood surfaces on which Poly-Wall® Self-Adhering Membranes or Flashings will be applied. Designed to be used in ambient temperatures and surface temperatures of 40°F (5°C) and rising. Used on both vertical and horizontal surfaces. Use when solvent-based primers are not appropriate for use. Apply Shur-Tac™ Liquid Adhesive to a clean, dry, dust free and frost-free surface at a coverage rate of approximately 250 to 300 square feet per gallon on concrete. Exterior gypsum and OSB sheathing board products will vary in texture, performance, and porosity. The coverage rate for Poly Wall Adhesive/Sealants will be less than over concrete substrates. Specific testing for coverage is recommended. Other substrates may vary in coverage; please test accordingly. Spread the liquid adhesive sufficiently to avoid areas of excess material. Areas of excess material will lengthen the curing time on the application of the Shur-Tac­™ Liquid Adhesive. For best results Shur-Tac™ Liquid Adhesive should be applied and allowed to become tacky to touch, timing may vary due to atmospheric conditions. DMX AG™ is the leader in Foundation Wraps. It is the air-gap membrane that exceeds today’s most demanding building codes. It has received a positive CCMC Evaluation as a stand alone Dampproofing and Drainage Layer and is presently being reviewed by the ICC-ES in the USA. DMX AG™’s air-gap membrane technology keeps basements dry, no matter what the weather or soil conditions. Unlike traditional foundation coatings, DMX AG™ bridges cracks and drains away moisture to the FlexTube™ footing drains. By controlling both interior and exterior moisture, DMX products virtually eliminate foundation leaks and expensive callbacks. What’s more, DMX AG™ is tough, Earth Friendly, and easy to use. Because it retains its flexibility over a wide range of temperatures, installation is fast and easy, even in cold fall and spring weather. No special breathing or skin protection needed. And thanks to its high tensile and compression strength, it won’t tear during installation or back filling. Did you know that the average 6’ roll of DMX AG™ contains 300 recycled detergent bottles!! DMX AG™ can add significantly to your LEED certified project through it’s recycled content and additive package that enhances the products sustainability. Here are some of the more significant benefits and advantages you will get when you use DMX AG™ on your project. DMX AG™ resists potential damage during backfill. Made from High Density Polyethylene (HDPE), a tough durable material, DMX AG™ does not require the special protection boards many other products do to survive construction. Highest compressive strength in the industry. Highest tensile strength in the industry. Heaviest Sheet (g/m²) for strength and durability in the industry. Install and backfill faster than with traditional spray applied products. You can install DMX AG™ soon after the forms are removed. No waiting for foundation walls to fully cure or dry before installation. As the name implies, DMX AG™ stays flexible and easy-to-use in any climate, it is not weather dependent. DMX AG™ bridges even large foundation wall cracks that cause water infiltration and damage, callbacks and unhappy homeowners. Our dimpled sheet provides a protective air gap that keeps water out of the cracks by providing a negative side drainage channel, unlike tar-based products. New walls are full of moisture. DMX AG™’s air gap technology allows moisture to exit the wall and work its way to the footing drain. Wet soil never touches the foundation. Walls dry properly so they are not damaged by freeze-thaw cycles. HDPE is safe and environmentally friendly. It won’t leach harmful chemicals into the soil around the home, as tar-based products may do. Because there are no harmful chemicals involved, you do not need special breathing and skin protection during installation. Just your usual: safety shoes, glasses and a hard hat. You get support from a company you can trust. Our goal is to make sure you never have a second thought about choosing DMX AG™. DMX AG™can be specially modified to suit special needs on a special order basis, which is one of our hallmarks of customer service. Learn more about installing DMX AG™ on our Frequently Asked Questions page. Or download a completeInstallation Manual. CAD or PDF Drawing Details (Generic Installation) – Click on CADdetails link below. Most poured concrete basements have cracks of some kind that occur during the curing process. This is very common at window openings, beam pockets, and sometimes at corners or elevation changes. When the soil around the foundation gets wet, it creates a constant hydrostatic pressure against the wall that will push water into the basement, even through the tiniest crack. Moisture can also get into basements through capillary action which acts like a sponge and draws water from areas of high concentrations (exterior soils) to areas of low concentrations (interior basement walls) especially in the presence of minimal foundation protection. DMX AG™ isolates these cracks and capillaries from the surrounding wet soil, to prevent this from happening, and provides a clear negative side drainage path for ground moisture to be redirected to the footing drains, eliminating lateral water flow into the basement. How does DMX AG™ work? DMX AG™ creates an air gap between wet soil and your basement wall, allowing the poured concrete and concrete block walls to breathe and provides a clear negative side drainage path to disperse any ground moisture that might find it way behind the membrane. Wet soil never touches the wall next to your living space, thus reducing the chances of water infiltration into the basement. The DMX AG™ is made of HDPE which is an impermeable material to water, and when installed according to our installation guide keeps water exterior to the foundation walls. This means dryer basements for the end user, and a wider choice of finishing materials for completing a basement area. Why does DMX AG™ have dimples? The dimples in DMX AG™ create a negative side air gap that eliminates the hydrostatic load (pressure) that forces water into the foundation, via cracks and capillaries as discussed earlier. Without the dimples in DMX AG™ the product would be in direct contact with the foundation exterior, minus a negative side clear drainage path, that potentially could trap moisture against the wall should it get behind the membrane and force water intrusion into the basement. The key to the success of the DMX AG™ is the dimple for the control of hydrostatic pressure and ground moisture control. Can water get behind DMX AG™? In most cases – highly unlikely when installed properly. However, even if the sheet was damaged and water got behind it, the air gap would prevent water from getting into the home by diffusing hydrostatic pressure build up and providing a drainage path to the footing tile. Because there is no direct soil contact with the wall, water just drains down to the footing and away through the drainage system. The configuration of the dimple structure allows for continuous flow of water along the path of dimples and air gap to the footing drain, and resists the transport of drainage water to the foundation wall. The “conical” shape of the dimple provides a low resistance to vertical water flow and minimizes lateral movement of water, providing maximum protection of the foundation wall from moisture contact with the wall. Do I need special fasteners to install DMX AG™? You will need DMX Quik Clips and plastic washers for attaching the membrane to the foundation. Use with 1¼ inch concrete nails for poured or concrete block foundations, and 1½ inch coated deck screws for ICF foundations. DMX FlexTrim is available for sealing cut edges in the membrane where the flat panel has had to be trimmed off, such as around basement below grade windows or along the top of the membrane on a slope. For full details, download our DMX AG Installation Manual. What types of foundation can I use DMX AG™ on? Every type you can think of—poured concrete, Insulated Concrete Forms (ICF), block wall, and wood. Can I use DMX AG™ for repairs and renovations? Absolutely! DMX AG™ will protect everything from a modest crack in a residential foundation, to the stone foundations of century-old churches and homes. We have heavy clay soil. Can we use DMX AG™? Yes! We suggest installing an extra row of DMX Quik Clips in the body of the DMX AG to help stand up to the vertical pressure heavy clay soil can exert on the membrane and wall. (See our Installation Manual for details. Is DMX AG™ just for walls? Not at all! You can use DMX AG™ for underslab vapour barriers, exterior wall protection, interior wall repairs*, built-up flower beds, retaining wall protection**, around culverts, and many other commercial or industrial applications. Keep watching as we come up with even more! If your application calls for more robust drainage than simply moisture protection, you can use our DMX Drain™ Geocomposite Drainage Boards which are economical and very effective. Can I use DMX AG™ without a perimeter drainage tile? Yes, but only in areas where there has been extensive geotechnical studies done to determine that a drainage tile is not necessary and the local water tables are not expected to cause any problem in terms of load bearing for the soil conditions. Consult you local Building Code or Regulations on the implementation and requirements regarding the installation of weeping tile or drainage pipes as defined in the Codes or by a Professional Engineer competent in soils investigations. TAMKO TW-60 is a flexible, self-adhering, rubberized asphalt sheet waterproofing membrane with a polymer film on the surface and a removable treated release film on the adhesive side. TW-60 is especially well suited for below-grade waterproofing of foundation walls, tunnels, earth shelters, ICF forms, and similar structures. 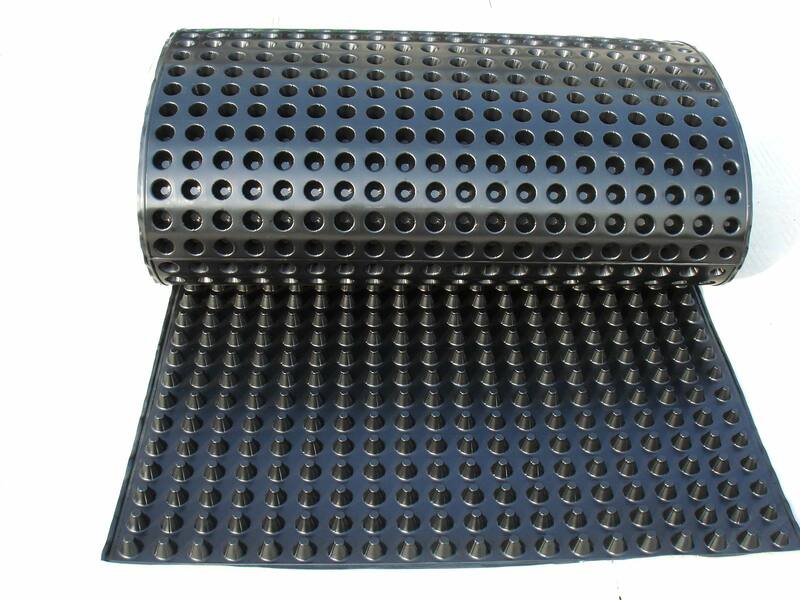 The TW-60 membrane is also suitable for waterproofing plaza decks, parking decks, balconies, and terraces. High temperature resistance up to 240ºF. 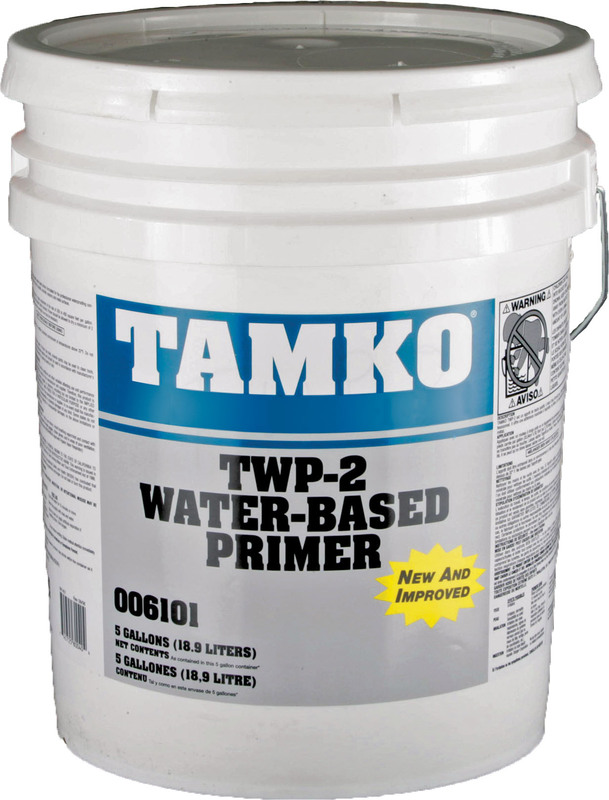 Use TWP-1 Quick Dry Primer or TWP-2 Water Based Primer to help prepare surfaces to receive TW-60 Sheet Waterproofing Membrane. Water-based-excellent primer for use on ICF surfaces.